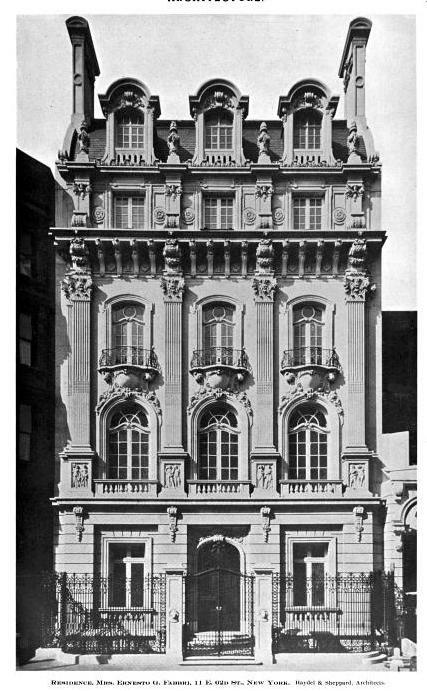 The Ernesto G. Fabbri residence designed by Haydel & Shepard c. 1900 at 11 East 62nd Street in New York City. The residence was built as a wedding present by Margaret Vanderbilt Shepard for daughter Edith and husband Ernesto. 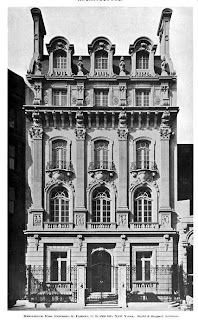 In 1916 the Fabbris moved to 7 East 95th Street. Click HERE for more on the Fabbri residence and HERE to see it on google street view. Photo from Architecture, 1900. The Society for Italian Immigrants is a secular corporation organized in New York in 1901 for the aid and protection of immigrants. It has no religious affiliations. The Italian government makes it an annual appropriation equal to the amount received from all other sources, and its income is derived from the subscriptions of those interested in philanthropic work. Its home has accommodations for 200. It has founded four schools in Italian labour camps to prevent the demoralization usually attending those communities. The enormous volume of Italian immigration during recent years may be realized from the fact that from 1880 to 1908 it amounted to 2,500,000. In 1857 it was about 1000; in 1880 it was 12,000; in 1907, 286,000. It is estimated that 250,000 aliens arrived in the United States between 1789 and 1820. From 1820, when the official records begin, to the end of the fiscal year, 30 June, 1907, the number of immigrants arriving was 25,985,237. I actually snapped a pic of this a few years ago for my flickr account. Fortunately the Japanese embassy will not alter the interiors of this mega mansion. A richly detailed townhouse facade. The standout of its block for sure. Glad to know that any updating required for the consulate will preserve as much of the interiors as possible. Love this place, belle epoque lushness and ambition at its most lively. Had Haydel & Shepard not imploded, it would have been interesting to see where their designs would have gone---they've got some of the loopiness of Warren & Wetmore, but not the wit, and the sharpness of Carrere & Hastings---although I'm not sure but Haydel's impending madness shows in the plinths of the pilasters and in the cornice. The frontispiece and pediment of the Church that they designed for Mrs. Fabbri's mother is Barroccocococo to the max. I really like this house. I think of Fabbri and his wife giving it up for that odd confection uptown and I'm reminded of Charlotte Moss's famous crack about bedrooms with dusty lampshades.